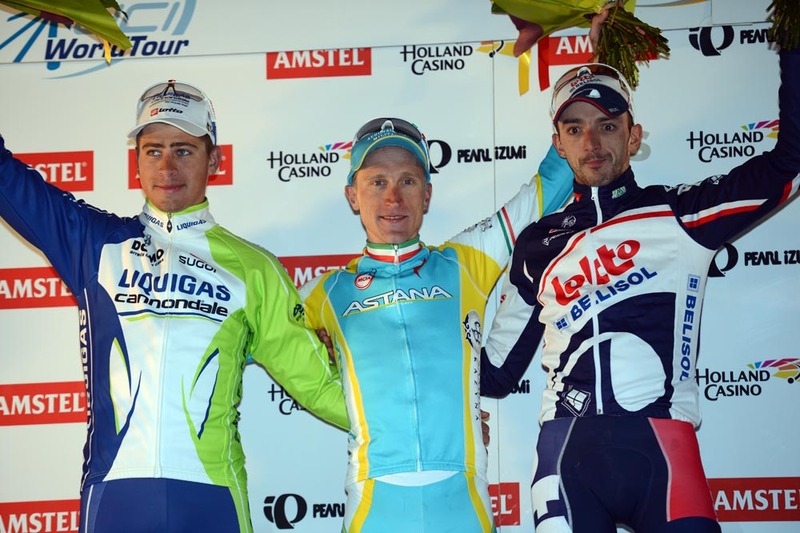 Italian Enrico Gasparotto (Astana) won the 2012 edition of the Amstel Gold Race on Sunday. Gasparotto out-sprinted Jelle Vanendert (Lotto-Belisol) and Peter Sagan (Liquigas-Cannondale) to take the opening Ardennes Classic in the Netherlands. Philippe Gibert (BMC Racing) failed to take a third consecutive win in the race. Despite leading the charge up the Cauberg, his effort in the finale was simply not enough to hold off his rivals and he came home in sixth. An early nine-man escape had managed to put 13 minutes ino the bunch during the first half of the 250km race. The relentless roller-coaster climbs took their toll on the escapees, and as the race reached the final 30km only Romain Bardet (Ag2r) and Alex Howes (Garmin-Barracuda) were still up front. The pace of the day spelled an early end for a couple of pre-race hopefuls, including BMC’s Cadel Evans who called it a day as the race touched the final 60 kilometres. The loss of the 2011 Tour winner didn’t stop his BMC squad from controlling the chase group, with defending Amstel champion Philippe Gilbert sitting near the front. Edvald Boasson Hagen (Sky) leapt out of the chase group 14km from the line, a move which caused the bunch to string out along the narrow roads. Bardet and Howes kept the moment going up front, working well together but with the bunch whittling away their advantage. Boasson Hagen was caught on the final turn up Keutenberg, the penultimate climb of the race and quickly went backwards. BMC were still firmly in charge of the bunch, with Gilbert on second wheel behind Greg Van Avermaet. Howesstarted to struggle into the final 10km. Bardet continued alone but was inevitably caught with just 9km to ride, his long day over. Oscar Freire (Katusha) was the next to have a dig and quickly put considerable amount of fresh air between himself and the group. But with 5km to ride, it was a big task to stay away. Shoulders rocking from the effort, Freire benefitted from a disorganised chase from the 20 or so left in the bunch. Freire hit the base of the final climb of Cauberg with an 18 second advantage, with Niki Terpstra (Omega Pharma-QuickStep) chasing hard. Gilbert then upped his pace as a crash in the bunch floored Damiano Cunego (Lampre) and Lars Petter Nordhaug (Sky). Enrico Gasparotto (Astana), Jelle Vanendert (Lotto-Belisol) and Peter Sagan (Liquigas-Cannondale) matched Gilbert’s pace. As the Belgian champion faded in the final metres, Gasparotto came around Sagan and Vanendert to take the win. The Ardennes Classics continue on Wednesday with La Fleche Wallonne and conclude on Sunday with Liege-Bastogne-Liege. Last season, Gilbert scooped all three races. So far this year he has failed to score a victory.